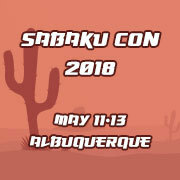 This is a full event membership to Sabaku Con and will get you into all non-paid events during the entire convention. This membership will get you access to Sabaku Con on Friday for all non-paid events. This membership will get you access to Sabaku Con on Saturday for all non-paid events. This membership will get you access to Sabaku Con on Sunday for all non-paid events. This is a gaming only badge for Sabaku Con. This will only get you access into the gaming room during the convention.